215 video minutes / QI Gong and Taijiquan were researched by Harvard University Medical School and several other universities throughout the world. The results were that they are the greatest well kept secrets in medical history as the amount of disease they can cure and prevent are astronomical. The system includes four individual DVDs that work excellent independently and combined create supernatural powers and immortality forces. Professor Joseph Dodaro in the pictures on the website and PDF manual are in his 60s the best combat condition of his life with no prescription drugs. QI Gong executes the transformations of secret energies that energizes your mind and body destroying psychoactive substance abuse, psychological dependencies, depression, stress, and negative energy that destroys internal organs. QI Gong is a dynamic life force energy that is the foundation for all Chinese Military Systems. QI Gong was researched over 7000 years by Emperors, Generals, Taoist Monks, and Shaolin Monks that structured routines strategically, scientifically, and ingeniously in a vital chronological order executing extraordinary QI energy force.QI Meditative Pressurized Force Breathing is the secret weapon that keeps you vibrant, energetic, young, and powerful. At 62 years old Professor Dodaro is exhilarated as the system has revealed the secrets of universe to him as he lives his Dreams. 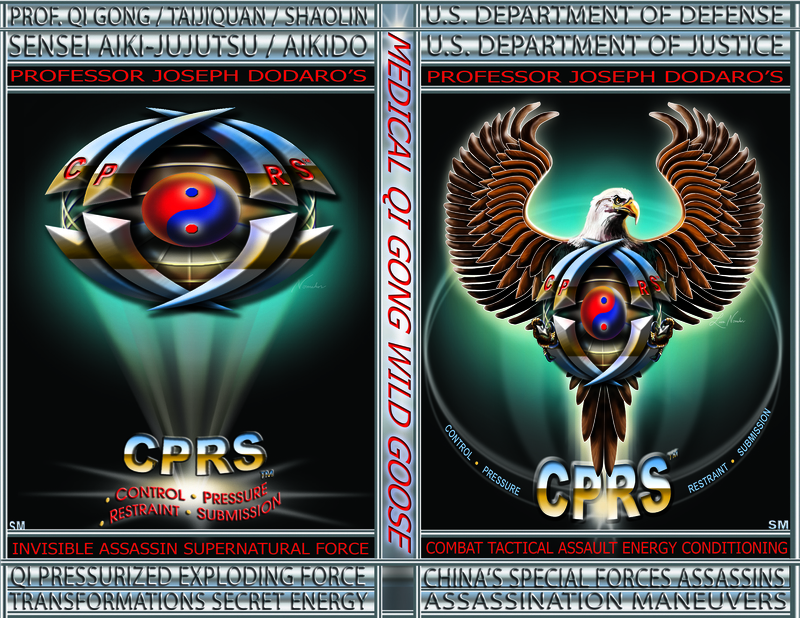 (Element one) Medical QI Gong Wild Goose 3 hours 35 min. 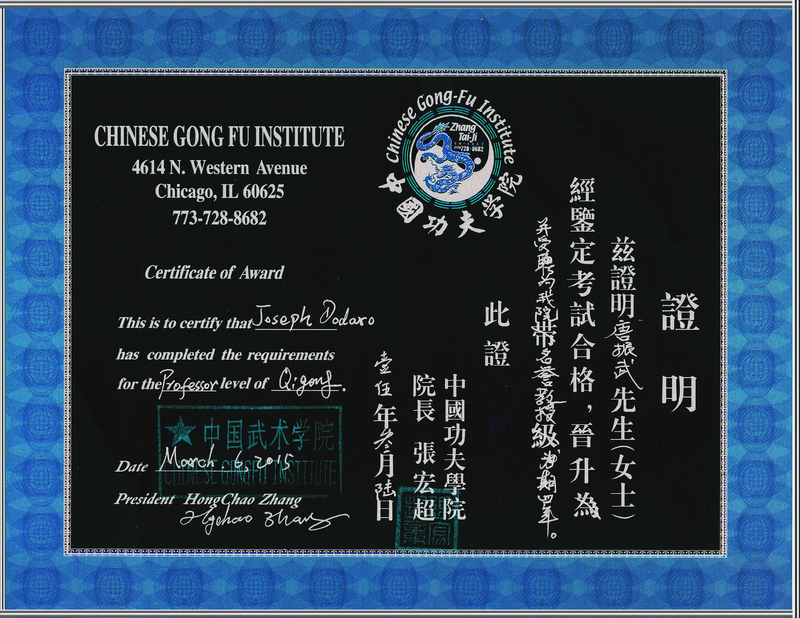 presented by Prof. Joseph Dodaro of QI Gong advanced March 6, 2015 by Dr. Hong Chao Zhang of Wushu. . A government educator Zhang is one of the five founders of QI Gong Research Association at Wuhan and Shanghai Institute of Physical Education where he holds Bachelors and Graduate Degrees in Gong Fu. Medical QI Gong was developed from Wild Goose Kunlun Dayan QI Gong in China’s Mountain ranges by Taoist Monk Dao An about 2000 years ago that evolved from the traditional system 7000 years ago. Prof. Joseph Dodaro demonstrates each intricate movements slowly with extensive comprehensive methodology making it simple to follow and understand the complexity of energies. Female students perform movements slowly as Professor applies pressurized force in various areas to demonstrate how to strengthen internal structure executing Shen Psyche the unconscious and conscious mind. The amount of repetitions is controlled by the individual practitioner adjusting the length of the form. Movements are strategically, scientifically, and ingeniously structured in a chronological order to execute the transformations of energies developing supernatural powers. Shen QI Meditative Pressurized Force Breathing is vital to execute the three secret treasure energies Shen, QI, and Jing in the microcosmic orbit.This magnificent transformation of energies explodes with the secret forth energy Chen devastating force strike. QI Gong is vital to train daily as energies must rejuvenate every 24 hours. Shen Psyche the conscious and unconscious mind executes transformations of energies in each intricate movement that is necessary to develop supernatural powers that enhances health, longevity, and intellectual skills. Transformations of energies take a lifetime to master that is exciting as there are no limits to your imagination. The more you train the comprehensive methodology takes you to discover the secrets of the universe. Be patient and concentrate on learning one energy as Shen, then add a second QI, then third Jing as you will feel these energies circulating through the 13 organ systems, 78 organs, and 20 Meridian thrusting channels that allows you to feel secretive energy forces. The transformation of these acupuncture energy field points strengthen the pathways to have immediate combat response. The pineal gland of the endocrine system in the epithalamus center of the forebrain close to be Yintang Dantian acupuncture energy field secretes hormones into the bloodstream executing animal instinct and behavior. Simultaneously transmits a powerful electrically signaling transforming with the Yintang and Taiyang signals that are activated together as sensory neurons intensifying the retina to transmit signals to Shen Psyche. Special Forces Assassins transmits combat signals on a highly developed frequency to Shen Psyche that sends this electrically signaling through the cranial nervous system by sensory neurons electrically excitable cells. The contractile muscles are sculptured, cut, and developed to execute tremendous force withstanding excruciating pain for extraordinary power in the assault. Commands are transmitted astronomical times during traditional military secretive systems and maneuvers through the nervous systems that directly is in contact with the contractile muscle, meridian pathway channels transmitting through the fascia a covering surrounding muscles,and internal organs. Nerves move muscles in response to voluntary and autonomic involuntary signals from the brain. The somatic nervous system is the part of the peripheral nervous system associated with the voluntary control of body movements via skeletal muscles. The SoNS consists of afferent and efferent nerves. Afferent nerves are responsible for relaying sensation to the central nervous system while efferent nerves are responsible for stimulating muscle contraction, including all the non-sensory neurons connected with skeletal muscles and skin. Special Forces Assassins developed slow twitch muscles in static low strength pressurized force Tiger stances for two minutes to resist fatiguing. Then explode into dynamic aerobic Tiger stance without fatiguing as tendons and ligaments strengthen for quick change of direction. Muscles cells are specifically developed for combat assaults through nerve pathways. Assassination Maneuvers executes Shen deep meditative pressurized force breathing that calms the body allowing energy to travel through the cranial, central, and into the peripheral nervous system. Low Tiger maneuvers place tremendous pressurized force to strengthen contractile tissue by increasing muscle cell growth (hypertrophy). Simultaneously pressurized force breathing executing oxygen through the circulatory and respiratory’s systems are vital to increase bone density (ossification). The endocrine system secretes hormones into the bloodstream and executes the most powerful electrically signaling that outlast the nervous system signaling developing the assassin with supernatural powers. The fascia is stretched allowing 12 meridians channels and eight superficial channels opening pathways for QI energy force to travel enforcing Yin Yang intrinsic energy that protects the outer and inner layers of the skin. Yin Yang intrinsic energy explodes in combat withstanding excruciating pain and executing explosive force continually. Joints open as the Tiger pressures lower in the crouching stance for one minute to create greater force in motion. Bones connect to bones by ligaments (connective tissue) that are stretched to lengthen to prevent injuries allowing joints to be more supple with greater range of motion. Cartilage compresses and expands strengthening tissue as synovial fluid is injected into the joints to protect them from shock and supplies oxygen, nutrients, as it removes carbon dioxide and metabolic wastes from the chondrocytes within the surrounding cartilage. This process is vital to prevent arthritis in the joints that can cripple the structure of the body the entire life.